June’s theme for Healthy Families Jacksonville’s monthly gathering was fathers: Dads play a major role in their children’s health and need the same childrearing information, tools and skills that moms receive in order to help create positive child development. Healthy Families is a free, voluntary, early learning and family support program designed for families to get the services and skills needed to prevent child abuse and neglect. The program concentrates on the wellbeing of the parents to ensure the child is living in a secure environment. The relationship between a child’s mom and dad, even if they aren’t dating or married, needs to be healthy – since toxic behavior between parents can be harmful for the child and hinder healthy development. 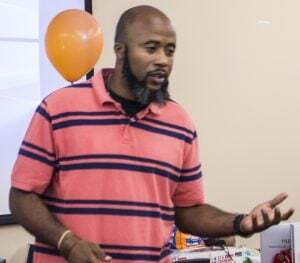 Single dad Devin Coleman was selected to speak about his personal experience coparenting. His life changed when his daughter’s mom had a boyfriend demand that Devin be removed from the lives of her and their daughter. When Devin received full custody of his daughter, he experienced the difficulty of single fatherhood – having little childrearing knowledge since being separated from his child. He still believes that open lines of communication with the mom are in his daughter’s best interest. When women strip parenting tasks away from men in a “mother knows best” approach, Devin suggests that moms explain to dads what a child’s needs are and how to address them and dads express when they don’t know how to do a parenting task and would like to learn. At the family gathering, dads also showcased their parenting skills as two tag teams of two dads raced to change a baby’s diaper and put clothes on the baby the fastest. Each participant walked away with the knowledge needed to involve dads who want to be there for the child to live a healthier, happier life. Go here for all photos of the event.